One of my favourite websites, Apartment Therapy features a regular "Through My Window" entry where readers send pictures of what they see through their window. I thought it would be interesting to feature what I see through mine. 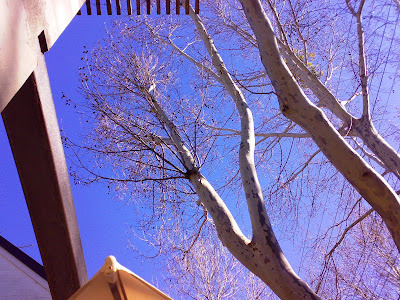 Every morning, with my white roller blinds down, I see the artistic silhouette of the trees outside my window. They are now bare in the winter and look very skeletal, but in a desolate and beautiful way, if skeletal can be that. I find that image like that of a photo negative, the pure black and white, casting a surrealistic, cinematographic quality about it. The night scene on the other hand, is vibrant, the contrast of old brick buildings refurbished to house funky shops catering to every adult fetish, hip Asian restaurants and take-aways, numerous gay bars and clubs and other slightly more mainstream shops selling art supplies and gay literature (ok I said SLIGHTLY more mainstream not completely mainstream). Tonight there was another different scene through my window. It was the night of the lunar eclipse where the earth comes in between the moon and the sun and throws its shadow on the moon covering it completely for a moment. The moon bled a dark crimson orange at the time I took this picture. Three different images, all in the same 24 hours. Isn't life ever changing? This is the famous Bourke Street Bakery. Or just outside. This is the omnipresent queue (apparently visible even on Google Earth) waiting to get their sourdough loaves, ginger creme brulee and lamb harissa sausage rolls. And this is me hooked on my poison. For the last few weekends, we have been having brekkie together at various nearby cafes. Me, always ordering toast with preserves and a latte, G, always ordering toast with avocado, cheese and an egg with a skinny flat white. Both, always poring over the papers as we devour our breakfast in companionable silence. 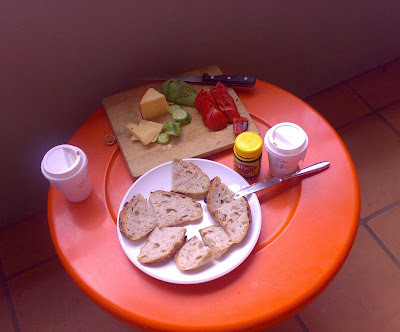 So we decided that for this Sunday's breakfast, we would buy a sourdough loaf (and a couple of coffees) from my favourite Bourke Street Bakery, some avocado, tomatoes, cucumber from G's grocer, and I'll bring a supply of King Island cheddar from my fridge and we would assemble our own cafe-style brekkie. That's what we did late morning, the apple and oat sourdough was super delicious, the tomatoes sweet with a dash of balsamic vinegar and a generous sprinkle of salt, the avocado and cucumber were a refreshing difference to the cheddar and we ate the whole loaf bar 2 slices (saved for my lunch of tuna and avocado sandwich tomorrow). And actually we ate enough for lunch too, well and truly stuffed - but at least it was healthy! Cost of our self-catered cafe-style brekkie: $15. Cost of our cosy, jointly-assembled efforts enjoyed in G's balcony: priceless. This was an unusual fish pie. 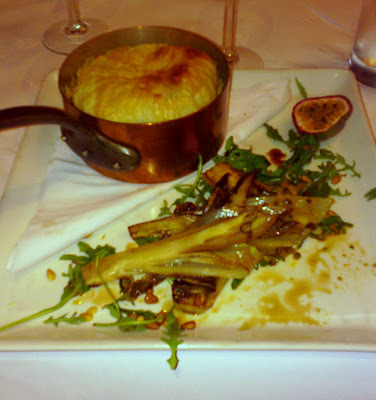 It was artistically presented (I am assuming and also cooked) in a little copper pot, topped with a puff pastry lid. The accompanying salad of rocket, pine nuts, witlof (which only G knew what it was and had to enlighten us - it's the cabbage-looking vegetable), caramelised onions and passion fruit was aesthetically strewn on the side of the white square dish. Other than not being salty enough for me (and I normally don't add salt to my food at the table), it was quite good. The snapper was mashed up with some veggies and cooked like a stew. I was the only one who found 4 bones (not even little ones) in my pie, the other 2 people who had ordered the same thing at my end of the table, seemed to have no issues with bones in their pie. This was pretty good pub grub, quite different from the usual $7 steak variety of pub nosh. The effort put into in the beautiful presentation also differentiated this restaurant from the usual pub bistro. I'm definitely coming back to try the yellow fin tuna burger at the pub itself. It possibly might have been last Christmas when I last baked some rock buns. Been so long that I don't remember anymore. I started harbouring cravings to bake some this week. Rock buns are a perennial favourite with the folks from work, so simple to make and so yummy. Using the new measuring cup again seems to throw the proportions out of whack. Once more it felt like there was insufficient flour to the amount of butter. This time, despite what people say about baking being more of a science than cooking is, I chose to trust my instincts after the last baking fiasco. I deferred to my judgment to gauge how much flour to the amount of butter rubbed in and relied on taste for sweetness. Hopefully, they taste as good as they look. Out of the oven after 15 minutes, these little nuggets turn a golden brown and are chockful of dried apricots, raisins, cranberries and pineapples. It's been raining cats and dogs for the past 13 hours. And will be raining for the next 7 days, feels a little like Noah's Ark to me, the rain hardly letting up at all. I had spent amost 5 hours at the Gallery today, gallery sitting while JF went over to M's house with the van to pick up the dining table for himself and the sofa (bed) for me. Turns out that he needed me to gallery sit for a bit longer because he had to make a couple of trips with the van to transport some extra pieces of furniture which M thought the second hand furniture dealer had originally wanted but changed his mind last minute, leaving her in a state of panic since she leaves for Japan on Wednesday. In return, I was going to get the sofa bed free! Completely free, no transport charges even. So ended up that being payment for my 5 hours in the gallery I guess. I handled 1 sale of a lidded jar ($290) and packed up 2 pots which were collected so I did feel a bit useful! And pleased to be back in the gallery setting as well. When we got home, I threw the green sofa cover also provided by M, over the sofa cos the mumsy floral prints were really not my cup of tea. In a fortuitous way, green seems to be the uniting colour in this apartment, from my oriental tissue box cover, to my table runner, to my table cloth on my little coffee table (actually a pareo overlaid with a linen tea towel over a milk crate in reality). Green is also supposed to be the colour to assuage feelings of homesickness. Now that the sofa is in place, G and I can finally sit down properly together and watch TV. Everything is coming together nicely. Bored, bored, bored. On a conference call evaluating vendors and not feeling like I can contribute anything to this discussion. A lot of talk about work volumes, foreign language capabilities, vendor's interest in various markets... blah blah. Another 35 minutes to go before the call ends. I'm tired and sleepy and would like to have dinner, watch some mindless TV and go to bed early tonight. This winter, I noticed many bare trees, I don't remember all these beautiful, bare bones of trees standing against the sky last winter. There is a sense of desolation, of solitude, of peace and serenity these trees convey. Perhaps also with their silhouette, comes a message of hope. That when the cold winter passes, it will be Spring and with it comes a renewal of Life. This was a plan that had been simmering for ages. First it was just talk of various high teas being served at hotels and tea rooms that cost an arm and a leg. Then it became a "we can cater it ourselves too" brainwave. Finally it was the hunting for a (preferably pre-loved) 2-tier cake stand. A lot of fruitless searching, finding those that we didn't really like and then finally finding the One. And that crystallised the event - the English High Tea. Logistics were carefully thought through (venue, timing and very importantly, the number of chairs we needed!). And so this was the long-awaited Sunday. The menu was organised and everyone anticipated the baking and the eating. Most people (read: the girls) went to work with the preparations. The boys found ways to get around this technical obstacle and still miraculously managed to produce their contribution to the High Tea. In the end, we prepared way too much food as usual. The menu consisted of various types of cupcakes, an orange cake, scones with King Island cream and strawberry jam, tuna sandwiches, mini mushroom pizza, risotto balls, fig and apricot dessert with yoghurt. Faced with several varieties of tea on the table, we opted for an Earl Grey and a Black Tea with Vanilla. Everyone overate, I drank a copious amount of tea, trying to convince myself that the tea would wash down all the richness of the English Tea and aid digestion. Then we all sat around, not moving, not saying very much at the end because we were stuffed to the gills, and were all thinking a siesta would be a good idea at that moment. It was a very good English High Tea, beautifully presented and as we said good bye, we were already planning the next pig-out session. Am flexing my muscles in the kitchen, trying to bake the orange cake and various other variety of cupcakes for the high tea tomorrow. However, not having baked in ages, I seem to have lost it. The process takes ages, the butter seems a bit too much for the other ingredients and just would not be absorbed into the cake batter, it seems over-saturated. I am beginning to suspect the online cooking conversion website. Things were better and easier when I used the old rule of thumb method I recalled from Home Economics 101. Now my cake batter is over-saturated with butter and too sweet. I had to remove lumps of butter, add more flour to balance the sweetness out, and throw in another orange worth of juice and pulp. Then I find out my oven doesn't work! Had to hotfoot it down to G's house to use his oven. We finally packed everything and popped the cake trays into the oven. The overly saturated batter starts sizzling with a layer of oil when the cake starts taking shape. I had to tip out the extra oil a couple of times, dang that stupid website, the conversion is really wrong. I completely blame it. This is a disaster. The next day, I had to make the mushroom pizza thingy and in the process, I suffered a really bad burn on my left index finger, the pain was intense and lasted several hours. A raised long welt formed immediately and that will translate into an enduring battle scar of this ongoing baking disaster. This baking saga is a labour of love for this English high tea which we have been fantasising about for ages. It had better turn out good. This babe is so cute he makes me feel like the witch from Hansel and Gretel. Makes me want to eat up this yummy baby! He is so cute and sweet-tempered, everybody loves this baby. He's more delicious than the food we had at the barbeque. I sound like a cannibal... I should stop. This is good bye. Or rather as M puts it, this is see you again. 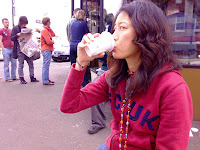 She is moving to Tokyo in less than 2 weeks' time and the gallery folks, regular customers, potters and stallholders at the weekend markets she used to have a stall at, turned up for dinner at the Dragon Den, a Vietnamese restaurant in Darlin ghurst. We ordered a banquet, that being the easiest option with 13 people at dinner, with several others popping by in the middle of the feast. The entrees came quickly enough and then there was a hiatus. We started to get hungry, wondering if more food was going to come - like tonight? M circulated amongst her friends, reminiscing old times, talking about new life events soon to come, we all took turns to share our best memories/first impressions of M.
Mine was of a partner in crime of sorts, bossing JF around his own gallery - just because JF needs bossy people like us around in his life for some counter balance. How JF will miss her when she is gone, who will tidy his desk, tell him how to run the gallery and point out to him when his decisions are not commercially viable? I will miss her too, her other side, of her gentleness and sensitivity at sensing when I wasn't feeling all there, and quietly asking me if I was all right. How she had caught me at those quiet, pensive moments, staring out in the distance, standing by myself in the gallery, lost in my own private thoughts. I will remember her. And I'll see her again. I'm finally all unpacked. The bags and bags of clothes were finally put away. A shocking amount of clothes, contributed to a large extent by the stuff I carted back from the last trip home. The unpacking followed a simple system of sorts, tops were divided into short and long sleeves, bottoms were divided into skirts and pants. I'm going to make it my personal mission to wear all the clothes in rotation. No more wearing of the same 10 outfits all the time. I am making a conscious effort to ensure that everything gets a chance. Otherwise, it has to fall into the "if it doesn't get worn in the last 12 months, it has to go" category. So tired after the big move today, my back is hurting, my feet are aching. Early on, four pairs of quick hands make very efficient work. The Move was completed in 1.5 hours. Then a big yumcha lunch to reward the helpers. We must have worked up a good appetite cos we ate a lot. The weather was really nice and sunny for the big move and we had all discarded our hoodies, it did not feel like 11C! And then for me, more last minute vacuuming of the old apartment after the things were finally removed. Then back again to the new apartment for the unpacking and settling in. Managed to unpack everything except my clothes. Too, too tired to do that tonight. But I did do the laundry which was good, testing out the washing machine. Bought a takeaway dinner of fish and chips and ate in front of the TV, tonight being TV night. Some gratuitous shots of the new apartment. S om e of the things that I really like about it - the designer sink, the galley kitchen, G's paper lamp he brought over much earlier on (for ambient lighting), the glasses we bought (martini glasses are new ones from Freed om, the champagne glasses are pre-loved ones from the Opp Shop in Glebe, which we absolutely love and will be visiting frequently to check out their stock of glassware which is just fabulous). I love the shape of the glasses. They aren't just for cocktails, although G has his plans to bring part of his cocktail making treasure trove and leave them here so we can have drinks at both apartments. For me, I have plans to serve desserts and shrimp cocktails in these gorgeous shapes. What's not to like about glass? There are just so many beautiful things all around us. Very often very simply. This exquisite branch sitting in this vase is a Magnolia branch that M had cut from a backyard plant. It is so gorgeous and captivated my attention all the way from the corner of the gallery. I gravitated towards it immediately with my camera. Beauty. And the most beautiful things in life are the simple things. Oh happy day! Today I found what I had been looking for. Well, one of the things I had been looking for. There it was, sitting on the lowest shelf in the brand-new Salvos store on Oxford Street. A posher Salvos than any I've ever seen. It was one of the first things that I laid my eyes on, and I knew I had found it. It was two-tier, glass with gilt-edging. The handle was gilt/gold as well. It was a beauty and only for $12! It was a steal. I look it over, it is in a good condition, no chip anywhere. I hugged it to my chest, I had looked so long, contemplated a few, but settled on none. It's a beauty, just what I have wanted and a real bargain. I love treasure hunting!